In the past five years, Copenhagen, Denmark has been hit with two storms labeled by experts as “100-year flood events.” And the Intergovernmental Panel on Climate Change predicts that such extreme weather will only become more frequent in Denmark. Rather than hiding the heavy rainfall with a massive sewer expansion, the city is coming up with clever ways to embrace it. Take Copenhagen’s newly revamped Tåsinge Plads. On a sunny day it resembles any other park you might find in the city, but during a heavy downpour, the area undergoes a complete transformation. The park’s flower beds fill up with excess storm runoff; large sculptures resembling upside-down umbrellas collect rain water to be used to nourish plants later; and water storage tanks under the square collect additional water, which is pumped through pipes by the energy generated from kid-friendly bouncy floor panels above. This park is just one of 300 similar surface-based solutions to climate change that the city will implement over the next 20 years. 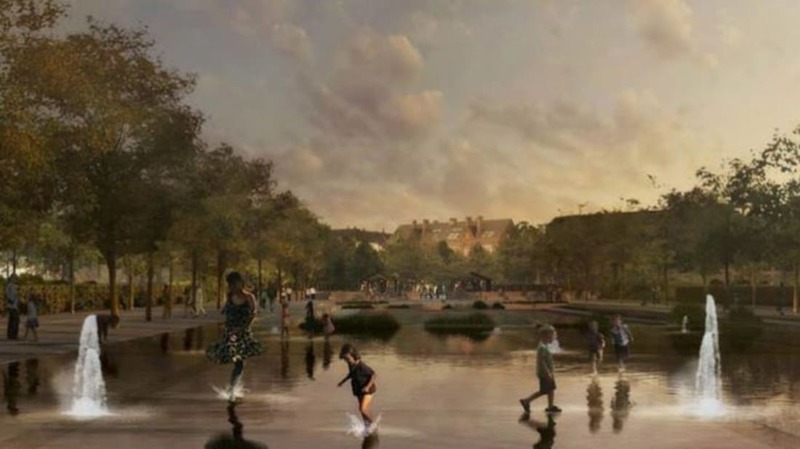 Future projects will include parks that transform into small ponds during rainstorms so water can be stored above ground until the drainage system is capable of handling it. Certain streets with raised sidewalks will be designed to become “cloudburst boulevards” in extra heavy downpours. This will effectively turn them into Venice-like water channels that will direct runoff safely through the city and into the adjacent harbor. The alternative to this so-called “green and blue” plan would be the expansion of the city's “gray” infrastructure, also known as the underground sewer and drainage systems. Not only will the green and blue system cost half as much as more conventional upgrades, but it will also provide the city with public spaces that will demonstrate their value to citizens rain or shine. You can check out concept art for these climate-adapted urban spaces (from the Copenhagen landscape architects Tredje Natur) in the photo series below. Images Courtesy of Tredje Natur.